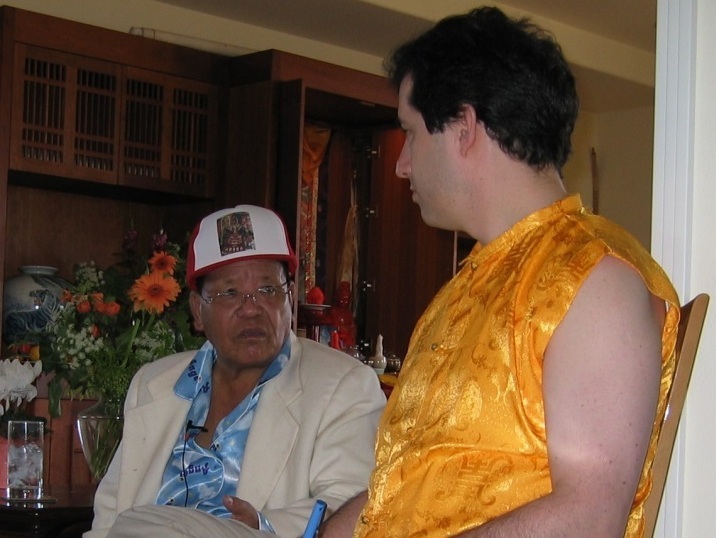 In a 1992 short biography, author Rigdzin Namnang Dorje offers a brief overview of His Holiness' revealed treasure teachings, comprising some twenty-five volumes "up to the present." Since His Holiness was never separate for a moment from the wisdom mind of Vajrapani, his teachings in fact were limitless, and continued to flow unabated into this world to the very end of his life seventeen years later, such that, in the words of the biographer, "it will be entirely appropriate to add such teachings as come to light in the future." Indeed, the new edition of the treasures recently compiled, edited and published in Chengdu, consists of thirty large volumes, adding many additional texts of teaching and prophecy. In several discussions with his close western students about five years before his passing, His Holiness gave his approval and blessing to their express wish to bring together many of the practice and instructional texts he had given in the west for their benefit, in edited and translated volumes suitable for study and practice. Tulku Sherdor, Howard Stahl (who in more recent years became a BWI Board Member) and several others were present at these meetings, and assumed responsibility for this work. So bounteous were His Holiness' dispensations, that despite his devoted students' best efforts, a number of these texts did not find their way into the edition recently published in Tibet (which of course is in Tibetan script only). After careful reflection and further discussion this year with Tulku Hungkar Dorje Rinpoche, who offers his support and blessing, Tulku Sherdor has assumed responsibility to publish one or several short volumes of additional treasure texts and teachings from His Holiness, to preserve them, to honor the teacher and teachings, and to benefit those with faith and a pure samaya connection to His Holiness who wish to practice the instructions they contain, and to honor them in turn. In an important sense, this effort is an extension of an even vaster project, begun by Howard in 1996 with approval from and appointment by His Holiness, to begin collecting the audio (and later, video) recordings of his many teachings given across the continent and over fifteen years in one comprehensive, searchable central database and archive, on which Howard has worked tirelessly ever since, with input and support from countless others. This project finally is nearing completion, and the availability of a single archive for all the oral instructions on the texts and practices His Holiness revealed and offered to us is of incalculable benefit. Only a few of these teachings, particularly the early ones, have also been transcribed in writing. Similarly, we have collected many gigabytes worth of video footage of these same teachings. We are still in the early stages of creating a definitive list of the treasure sadhanas and instructions revealed and composed by His Holiness that are in danger of being lost if a supplemental volume is not published. Cross-checking against the thirty-volume edition is somewhat painstaking, since the latter does not yet have a table of contents or index, and is loosely organized by volume according to the deity cycle or the type of practice. Thus, for example, the texts on the Great Compassionate One Amoghapasa Chenrezig are mainly in their own dedicated volume, but the short daily sadhana is in a volume of collected short sadhanas of many deities, a protector offering is found about five hundred pages into a separate volume of collected protector texts, and a version of the empowerment ritual is in a volume of collected empowerment texts. As this project moves forward, we will keep all interested persons updated, and afford opportunities to offer support for this continuing work and its publication in suitable form, including in English, Vietnamese and Chinese translation.